Is there anything better than the taste of an ice-cold, refreshing cocktail hitting your tongue as you bask in the Great British Summertime? Answer: no. Be the ultimate party host this year and educate yourself on how to whip up drinks so delicious your mates will be begging you to chase a career as a mixologist. We’ve called on nightlife know-it-alls, DesignMyNight, to give us the lowdown on this summer's finest tipples and after a kind word with some top London bars, we’ve got our hands on the secret recipes so you can recreate them at home. When it comes to whipping up innovative cocktails, Mr Lyan is at the top of THE game and his Queen’s Park libation at Super Lyan is no exception. To make it, fill a highball glass half full of ice then build in: 25ml Bacardí Carta Blanca, an equal measure of Bacardí 8yo, 15ml of sugar syrup and 10ml of both lime and lemon juice. Throw in 8 green leaves (you can use verbana, oregano or Thai basil), top with crushed ice and add in a dash of peychaud bitters. Finish with a sprig of mint and your delectable-sounding spin on the mojito is complete. 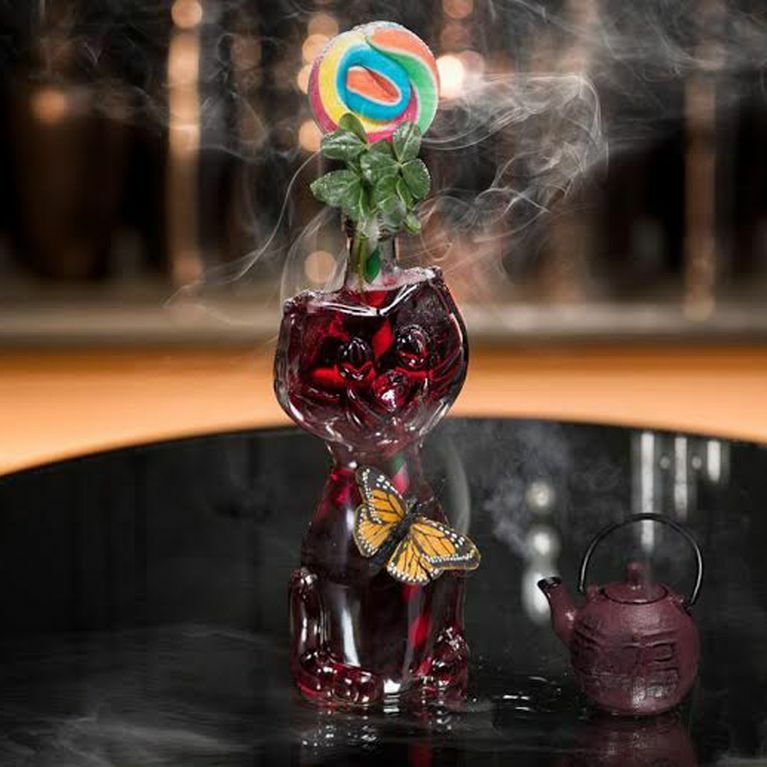 The Tea With Alice cocktail at The Gibson is every fruit lover's dream. If you think you’ve got what it takes to knock it up at home, roll up your sleeves and throw 50ml of rhubarb gin and 20ml of lemon juice into a mixer. Add a bar spoon of both sour cherry and blackcurrant curd, 10ml of milk oolong syrup and give it a good shake. To finish off, pour the cocktail into a highball glass and top with hibiscus tonic water, and voila - you’ve got yourself Tea With Alice. Not had much mixology experience? Luckily for you, The Pimm’s Fizz at Bourne and Hollingsworth Buildings is a foolproof tipple perfect for large summer gatherings. To recreate at home; fill a large wine glass with ice cubes, add 50ml of Pimm’s No.1, pour in lemonade (75ml) and some sparkling wine (25ml), then give it a good stir. Finish with an orange slice and a sprig of mint, then sip to your heart’s content. Ray’s Bar might be hidden underneath one of London’s best pizzerias (Voodoo Ray's), but it’s the expert cocktails that have the crowds flocking to its door. Giving a firm nod to the venue’s neon-look, the Pink Flamingo is a novice-friendly drink, perfect for summer. Fill up a wine glass with ice, add rhubarb liqueur (30ml), mix in Campari (20ml) and a dash of rhubarb bitters. Give it a stir, top with prosecco then finish with a generous slice of grapefruit. The Harcourt is a Scandinavian restaurant with a cocktail list inspired by their Nordic roots. Just so you're aware - the Berry Pine recreates a wild Swedish G&T, so you may have to venture further than Tesco to obtain all the ingredients. If you're up for the challenge, muddle some mint leaves and three lime wedges in a Collins glass with ice, add Botanist Gin (40ml), Zirbenz Stone Pine Liqueur (25ml), elderflower cordial (5ml) and half a handful of lingonberries (cranberries are a good alternative), then stir. Fill the glass with more crushed ice, top with Fever Tree Tonic then finish with rosemary and half a handful of lingonberries for Insta-worthy presentation. Midnight Apothecary is a rooftop garden that uses homegrown ingredients in its botanical cocktails. You can recreate their Chelsea Collins at home by building 50ml of Jensen's Old Tom Gin, 15ml of elderflower liqueur (St Germain’s is recommended) and rose petal syrup (10ml) into a shaker with ice. Add lemon juice (20ml) and a dash of orange bitters, then shake for 20 seconds. Strain your mixture into a highball glass full of ice, top with soda, then get creative with whatever's in your garden; go wild with jasmine, lemon zest, edible blossoms or strawberries. Apples & Pears is a firm favorite among Brick Lane revellers, and the Happiness Flor-ever is from their refreshing list of summer offerings. To recreate this crowd-pleaser at home, throw 40ml of Arette Blanco Tequila and 20ml of 1800 Coconut Tequila into a mixer. Add strawberry aperitif (25ml), 30ml of rhubarb and reship cordial and 5ml lime juice with four drops of Burlesque bitters. Finally, add 25ml egg white then give it a dry shake (this means shaking for 15 seconds without ice), so the egg white becomes frothy. Once your 15 second workout is finished, add ice and repeat for a couple more seconds, then strain into a glass for a taste of heaven. The SE10 cocktail at Craft London is one of their most popular serves and it doesn't take a genius to work out why. The mixologists here start by adding 20ml of gin, 10ml of wild strawberry liqueur (Craft recommend Wiltshire Liqueur Company), a 10ml splash of honey syrup and 5ml of lemon juice to a shaker brimming with ice. Give it a strong jiggle, strain into a flute glass garnished with a black pepper rim, and top with prosecco - because no summer drink is complete without fizz. The Walrus Room is a whimsical cocktail bar in Battersea known for its theatrical drinks. The Parisian Daisy, part of a #lumieres programme showcasing cognac in cocktails, is perfect for summer. To recreate it yourself, throw 25ml Courvoisier VSOP Cognac, an equal measure of lemon juice and rhubarb gin (they recommend Slingsby), elderflower cordial (15ml) and 1 drop of rose water into a shaker. Add ice then give a good shake before straining into a martini glass and finishing it off with a zesty lemon peel. A Giddy Thing is no speedy tipple to make as you’ll be knocking up dill and lemongrass vodka, as well as a sour solution but it's so worth it, promise. If you're partial to a challenge, infuse a 700ml bottle of vodka (they use Belvedere) with 50g of fresh dill and two sticks of bruised lemongrass and leave for 25 hours. Onto your solution: add a litre of clear lemonade to 75g of citric acid and 250g of caster sugar, then heat in a pot and stir until the sugar is dissolved. Add 7 lemon peels, let it rest for 2 hours, then pass through a sieve. Prep complete: combine your infused vodka (50ml), sour solution (20ml) and elderflower cordial (15ml) in a mixer with ice, then give it a hard shake. Strain into a highball glass with ice, top off with soda (100ml) and garnish with dill, a drop of lemon balm and a fresh slice of lemon peel. 13 Christmas Gin Cocktails to Put The "Merry" in "Merry Christmas"